Through the water researcher from Washington science has approached the view that water stores information and demonstrates completely new mechanisms in water. Apart from solid, liquid and gaseous forms the researchers were able to identify a fourth state, in which the molecules of liquid water are arranged in a hexagonal "crystal lattice". This state shows some amazing characteristics, which turns our picture of water upside down and solves many questions surrounding water. Water is a mysterious element even from a scientific perspective. Despite 200 years of water research science has not managed to completely understand the ever-present element of water. The official theory surrounding water is full of holes, the so-called anomalies, which cannot be satisfactorily explained with the conventional theory. Freezing point, boiling point, density, surface tension - even with these basic things water acts differently in comparison to what theory would expect it to act. However, water is also a fascinating element apart from science. It is the origin and elixir of life, the main component of the human body and our most important food stuff. Researchers from the USA have presented a new water theory, that could possibly explain the anomalies of water as well as an academic foundation for the refinement of drinking water. Researchers have established that water begins to arrange itself when near hydrophilic surfaces, such as in our bodies. Near the surface a layer of very pure water forms, whereby this layer changes to a completely new form of water, which is drastically different from traditional H2O. 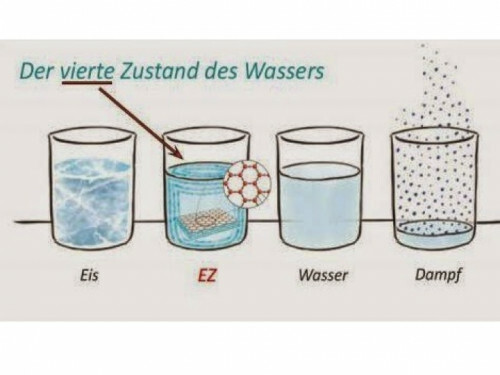 This zone, only measuring a quarter millimeter thickness, with the mysterious water has been called "exclusion zone" (EZ), because the water in this zone doesn't just arrange itself, but it also purifies itself as well: due to electric forces small particles are driven out of the EZ layer.